Reference - Take pictures of real abrasions, bruises and cuts FOR REFERENCE. If possible, take pictures during the healing process. Keep a file of actual facial features, beards, moustaches, noses, eyes and what ever else you can think of as well as wounds and burns etc. These can be invaluable. 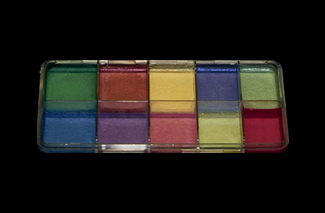 REEL HOT SHIMMERS PALETTE KIT contains the spectrum colors in metallics.